On New Year's Eve ten years ago, many people worried that Y2K would bring down the world's computers. This year, some writers feel that the signing of Jason Bay will bring down the Mets. Here the New York Mets go again, throwing money at a big-name free agent who they misguidedly convince themselves will solve their troubles. Boston understands value. Its proprietary formulas say something like what all of the publicly available metrics affirm: Holliday is one of the most valuable everyday players in the game, and Bay’s bat is a mighty force. And when assigning a dollar amount to their valuations, the Red Sox are saying: Right now, Holliday and Bay are incredible bargains. Even if Jose Reyes, Carlos Beltran and David Wright are all back at full strength in 2010, the Mets still need a big slugger in the middle of their lineup to replace Carlos Delgado. There were only two top hitters on the market and the Mets landed one of them. That is great news for the Mets. Will Bay's bat be the same "mighty force" in Citi Field? Probably not. But that does not mean the Mets were better off with Angel Pagan. The Mets needed a big upgrade in left field or at first base and now they have it. But what if Bay turns out to be the next George Foster, as Sports Illustrated's Jeff Pearlman believes? Pearlman and Passan both believe the Mets would have been better off spending the money on John Lackey, and I completely agree. But there is no assurance that Lackey wanted to play in New York, or that they would have been able to outbid the Red Sox for his services. Even if the Mets had managed to land Lackey, they would have ended up giving a five-year deal to an over-30 pitcher who has been on the disabled list at some point the last two seasons. So how is signing Lackey less of a risk than signing Bay? Both Passan and Pearlman buy into the notion that the Mets have a dreadful record when it comes to giving players big contracts through trade or free agency. But the Mets were in contention from 2006-2008 because of the big contracts they were willing to give out. Some moves obviously worked a lot better than others, but where would the Mets be without Carlos Beltran, Johan Santana and Francisco Rodriguez? Since 1985, the Mets have signed and developed five players who later wore their uniforms in an All-Star game. Five. Wright, Reyes, Todd Hundley, Edgardo Alfonzo and Bobby Jones. Even Kansas City can say it has passed eight homegrown All-Stars through its system. . . .
New York spent $3.1 million on the amateur draft in 2009. It was the lowest figure in the game. Ramping up their spending in Latin America – which has netted them their three top prospects, Fernando Martinez, Jenrry Mejia and Wilmer Flores – doesn’t excuse going skinflint stateside. All very true, but as the Red Sox and Phillies have shown, it is possible to have a payroll around the size of the Mets' payroll and still build a great farm system. But until that day comes, at least the Mets signed Jason Bay. Happy New Year. Here's to a much better 2010 for the Mets. Will Luis Castillo drop the ball to ring in the New Year in your house? And why is the Jeter tying Gehrig game on the list, and not the one where he sets the record? Very strange. Granted, I'm not sure of the TV rights issues. But there are other games I would like to see in the marathon. The one game I would most like to see again from 2009 on TV is ALDS Game 2, the first turning point of the postseason, the game that remade Alex Rodriguez's repuation, and one of the greatest games of the playoffs. Remember, the Yankees were trailing by two runs in the ninth inning, and the series could very well have turned out like their previous playoff appearances. But thanks to A-Rod's game-tying - and Mark Teixeira's game-winning - homers, the Yanks won the game. * 6/24/09 vs. Braves - The Yankees were struggling a bit - Brian Cashman had flown down to Atlanta to squawk at the team - and they were being no-hit by Atlanta. When Brett Gardner finally got a hit, he was picked off base. Joe Girardi was so frustrated that he got ejected arguing the call. Then the Yankee bats came alive, and they won the game. Unlikely hero - Francisco Cervelli with his first major league homer. * 5/8/09 vs. Orioles -It's A-Rod's first game back, where he hits a three-run homer on the very first pitch. CC Sabathia also pitches a great outing. First great game of the year. * 6/28/09 vs. Mets: Mariano Rivera gets his 500th save. But my favorite moment of the game is when Francisco Rodriguez walks him with the bases loaded. The Mets later infamously sent the pitching rubber to Mo as a souvenir; I wish they had also sent the baseball that he walked on over! And we were at this game as well. Hopefully, these games will make the YES Network eventually. I'm already a little wistful, though, when thinking about the great moments of Hideki Matsui, Johnny Damon, and Melky Cabrera. I'm sure our readers have other 2009 games they'd like to see on Yankees Classics. Tell us your suggestions! Throughout last season, Squawker Lisa and I contributed fantasy baseball analysis to Heater Magazine. 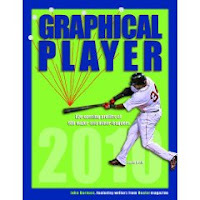 After the season, Heater editor John Burnson invited us to write individual projections for each Met and Yankee player for the Graphical Player 2010 , which has just been published. One of the best pitchers in the NL, where he seems to be more comfortable. If Vazquez stays in Atlanta, he should repeat his great year, as he found a situation that suits him, but all bets are off if he is traded. Projected 2010 stats and historical dollar values for single and mixed Roto leagues, as well as tallies for points leagues. Four years of career stats, including splits for RH/LH and 1st-half/2nd-half. Minor-league stats down to Single-A for 2009 for every player. Profiles of more than 100 prospects, with independent rankings from three experts. Speculative rosters for every MLB team for 2010, 2011, and 2012. Javier Vazquez trade: Does NL East have mercy rule for Mets? The only good things that have happened for the Mets this offseason are the Phillies getting rid of Cliff Lee and the Braves getting rid of Javier Vazquez. Thanks to their rivals, the Mets have at least some chance of competing in 2010. Granted, the Phillies are still heavy favorites to win the NL East, but if they had held on to Lee, there would have been a lot of debate in NYC about making 2010 a rebuilding year. As for the Braves, I know Squawker Lisa and many Yankee fans are outraged over the Vazquez trade, but even if Home Run Javy, as Lisa likes to call him, can't pitch in NYC, he is certainly able to pitch well in the NL East - last year with the Braves and earlier with the Expos. The Mets are much better off with Vazquez gone, especially when the only immediate return is Melky Cabrera. The Melkman may be a fan favorite, but he would not even be starting for many teams. And it's not as if the Braves have been smart lately when it comes to acquiring outfielders - their last big outfield acquisition was Ryan Church, who has already been non-tendered. So the Braves only have Melky and some prospects to show for dealing Vazquez and Jeff Francoeur. The best prospect, Arodys Vizcaino, just turned 19, so it will be some time before we learn whether this trade ever pays off for the Braves. The only player left in the Twins organization from the Johan Santana deal is Deolis Guerra, who was a couple of months away from turning 19 at the time of the trade. Guerra was hot prospect then and a key to getting the trade done. The young right-hander from Venezuela has loads of potential, but is still a long way from re-discovering his status as a top prospect. ...We shouldn’t worry about when we might see Guerra in a Twins’ uniform. More important right now is that the young right-hander re-discovers himself and becomes relevant again. The site ranked Guerra 15th out of the top 15 prospects in the Twins' organization. Guerra is still only 20, so he may yet pan out. But you never know what you will end up getting with a teenage pitching prospect, and if that is the main price to pay for a Vazquez or a Santana, it is well worth the risk. So thanks, Phillies, for creating at least the illusion of a pennant race by trading away Lee. And thanks, Braves, for another dubious trade. At least there has been some good news out of Philadelphia and Atlanta. Now if only we could get some good news out of Queens. Javier-self a lousy little Christmas, or why I don't want Javier Vazquez as a Yankee again! The news that Javier Vazquez is putting on the pinstripes once more - he was just traded for Melky Cabrera and Mike Dunn - is literally the worst thing I've heard all day. And given that I have been stuck at Newark Airport for over five hours now, and am looking at maybe another eight to ten hours before I can get a standby flight to Austin, that is really saying something! Yes, I'm angrier about Home Run Javy's return than I am at missing my flight to Texas this morning thanks to wretchedly slow security and baggage check. Grrrrrr. I called Squawker Jon a little while ago to tell him about my flight debacle, and he told me the trade news. I didn't exactly take it well - I screamed "Noooooooo!" into the phone. As I wrote on Facebook this morning, if Javier Vazquez is the answer, then I don't want to know the question. Yes, I know Vazquez had a great 2009 with the Braves. Carl Pavano also had a very good year as well, but I don't want him back, either. The first time for both of them in pinstripes was more than enough for me. Remember Vazquez's 5.00 ERA against the Sox in 2004, or his 9.95 ERA in the postseason against Boston? (Yes, I know that most of the 2004 roster is gone, but still.) While Javy did have a strong first half in 2004, he was so terrible in the last few months of the season that he was out of the postseason rotation. Yes, Joe Torre trusted Kevin Brown - broken hand and all - more than he did Vazquez. And I still have nightmares about witnessing Vazquez's last performance in pinstripes in person, on October 20, 2004, when he gave up a grand slam to Johnny Damon on the very first pitch, breaking Yankee hearts everywhere, and making me weep. A Red Sox fan/Squawker reader on Facebook asked me who I thought the Yankees should have traded for instead. I said Carlos Zambrano. He's a little wacky, but at least there's the hope he could be successful in New York. I have no such hope for Vazquez. Brian Cashman appears to be systematically getting rid of the postseason stars/good personality guys/players able to handle New York on this team, like Johnny Damon, Hideki Matsui, and now Melky Cabrera. It's one thing to trade Cabrera and get a pitcher in return - I can understand that. I just can't understand giving Vazquez another try. Been there, done that, got the t-shirt. We all know how important it is for a player to be able to handle New York. It's why Johnny Damon was worth every penny of that $52 million contract - he's a winner. Hideki Matsui hit a grand slam in his first game as a Yankee and became a fan favorite - and MVP of the World Series. Javier Vazquez, not so much. It's often been said that Vazquez is a pitcher that throws best when the expectations are low and his stats do back that up. Three of his top ERA+ years came in the anonymity of Montreal and one came for the 2007 White Sox, who went 72-90. This year's ERA+ of 139 equals his career-best with the 2003 Expos, but while the Braves stuck around as a potential contender for longer than expected, they didn't occupy striking distance space for long. Meanwhile, Vazquez's worst ERA+ years — with the exception of his first two seasons — all came with contenders: the '04 Yankees, the '05 D'Backs and the '06 and '08 White Sox. What the heck is Cashman thinking? He offers Damon $7 million a year (as one of our readers notes, less than even Mike Cameron is getting from the Red Sox), but takes on Vazquez's $11.5 million contract? Good grief. What do you think? Leave us a comment! Will you boo or cheer Johnny Damon when he comes marching into the stadium? I'm not happy that the Johnny Damon Era appears to be over for the Yankees. And I'm even less happy that Nick Johnson is the new DH. But, unlike Red Sox fans did, I plan on cheering Damon whenever he does come back to Yankee Stadium. And I would cheer even louder if he and the Yankees could somehow come to terms, and bring him back next year. Look, I didn't expect both Damon and Hideki Matsui to come back. But I also didn't expect Matsui to get such a cheap deal with the Angels - $6.5 million for a one-year deal. Or for him to be "replaced" with somebody more injury-prone than he is. So what if Johnson is younger - he can't stay healthy. While I was happy with the Curtis Granderson deal, I'm not happy with these other moves. But I will try to be optimistic that Brian Cashman has something good up his sleeve. A year ago this week, he gave us the best Christmas gift possible, with Mark Teixeira. Is it too much to ask for some other move this week to make Red Sox wail and gnash their teeth? Dare to dream! Who makes a better Philly cheesesteak - Pat's or Geno's? Who do Phillies fans hate more - Yankee fans or Met fans? And can you wear a Yankee hat in Philadelphia and stay safe? I tried to discover the answers to these and other questions by visiting the city this week. I live only 90 miles away from Philly, yet I hadn't visited the town in decades. But the Yankees playing the Phillies piqued my interest in the city - it actually looked like a fun place. Besides, as I noted last month, I wanted to do a Yankee victory tour, with me reenacting the Rocky steps scene. So, I decided to go check out the town, and I brought my pal Squawker Jon along as my partner in crime. To my blogging friend's dismay, I insisted on wearing a Yankee hat or a Yankee winter cap around Philadelphia for most of the trip. (Squawker Jon hid his Mets fandom and went incognito.) I wasn't sure what reaction I would get, but I hoped that I would merely get good-natured ribbing. I figured Phillies fans just don't have the same hatred for Yankee fans that they do for, say, Met fans. And I was correct. But the best reaction came from a Philadelphia police officer at the Philadelphia Museum of Art. I made Squawker Jon take pictures of me as I ran up the steps like Rocky, and hoisted my arms in triumph at the top of the steps. The cop, who was there with other police officers doing some training exercise where fellow cops rode bikes down the steps (looked pretty scary to us!) took in the scene, and told me this: "Parading around in a New York Yankees cap at the Philadelphia Art Museum? That's illegal!" Fortunately, he said it in a joking manner - and made his fellow cops (and us!) laugh as well. That quote might have been the highlight of the trip! 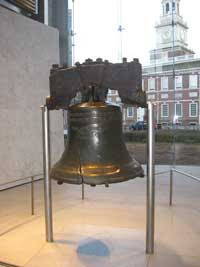 We also saw some of the usual sights, like the Liberty Bell and Independence Hall, as well as some other less-known treasures. For example, we absolutely loved the Reading Terminal Market, a combination farmers' market/high-end butcher/seafood store/unique shops/food court. There's really nothing quite like it in New York. We also liked just walking around and seeing what's what around town. At the end of the trip, we decided to weigh in on the great cheesesteak debate. Here's the story - rival restaurants Pat's and Geno's - across the street from each other at 9th Street and Passyunk Avenue in South Philly - both claim to be the go-to cheesesteak place. Jon and I figured we would argue about this, as we argue on pretty much everything else. We split a cheesesteak at each place (both with Cheez Whiz and onions, or Wit' Whiz, as I think it's called.) Then we made our votes. But, for once, Squawker Jon and I did not argue. We both agreed that Geno's was the clear winner. The city of brotherly love brought us on the same side for once! All in all, it was a great trip. The streets of Philadelphia were a lot of fun. And I have a sneaking suspicion the Yanks will be back there for next year's World Series. Coming tomorrow - my thoughts on the state of the Yankees! But in the meantime, tell us what you think. The way people view the Mets this offseason reminds me of the joke in "Annie Hall" in which the old ladies at the Catskills resort complain that the food is terrible - and such small portions. The Mets are criticized for not spending enough - and for throwing away money on the wrong players. How many times do you have to sign Kevin Appier and Bobby Bonilla before you recognize the difference between attracting the cream of a good free-agent class (see Sabathia, CC, and Teixeira, Mark) and the prettiest homecoming queens of Homely High?. . . It is one thing for a team with resources, such as the Mets, to muscle up for Mike Piazza or Carlos Beltran or Frankie Rodriguez, seminal players whose coveted gifts demand top dollar; it is another to throw money at players who would be second-tier free agents in other winters. The best news so far this offseason is that it wasn't the Mets who gave Randy Wolf $30M for three years. Joel Pineiro hopes to get an even more ludicrous contract. These over-30 pitchers have each come off one good season (not a great season, a good one) after years of injury and mediocrity. The numbers currently being discussed for Bay are a lot more reasonable than Scott Boras comparing Matt Holliday to Teixeira. Vaccaro thinks the Mets should avoid spending on Bay to save money for the great free-agent class of 2011. But there are no guarantees that any of those potential free agents are available, and if they are, that the Mets would be able to get them. Joe Mauer, Carl Crawford and Josh Beckett would be of interest to every team willing to spend on free agents, starting with the Yankees. Why shouldn't the Mets try to win now? Has everyone forgotten that this team won 89 games only a year ago? If everyone comes back healthy, the Mets still need a cleanup hitter to replace Carlos Delgado. And signing Bay helps the Mets not just now, but for the next few years, unlike Omar Minaya's signing of Moises Alou. Just because the Phillies are clearly better on paper does not mean that the Mets should go into rebuilding mode, as Klapisch wants them to do. Does Klapisch want the Mets to become the Indians? How has trading CC Sabathia and Cliff Lee worked out for them? While it is too early to judge the prospects acquired in those deals, it is not too early to say that the Indians stink now and are likely to continue to stink for the next few seasons. Still, the Mets have to make peace with the idea that the Santana experiment has failed, just as the Carlos Beltran, Pedro Martinez and Billy Wagner gambles all turned to vapor. Yet, they continue to chase The Next Great Star as if this was 2006 and they were one player away from greatness. In 2008, Santana nearly pitched the Mets into the postseason. Beltran has been one of the best players in baseball for most of his Met contract. Pedro and Wagner were both All-Stars until they got hurt. Of all these contracts, the only one that could be considered a failure was the one for Pedro, who was only able to give the Mets 1 1/2 out of four years. Wagner was a top closer for more than 2 1/2 years out of his four-year deal. For a free-agent pitcher, that is a good percentage. Klapisch should realize that the big-money signings are what propelled and kept the Mets in contention. Santana was not an "experiment," but a great move for a team that a the time was one player away. The problem is not pursuing high-profile free agents. It is having a lousy farm system, mediocre coaching that does not teach fundamentals and a questionable training and medical staff. It's true, dealing the franchise's best pitcher would be tantamount to surrender. But it would be at least be an honest admission to fans, who've grown weary of the all the disappointment. Yep, that's the way to please the fans. Just like in 1977, when the Mets traded Tom Seaver. What a relief to not have to worry about whether or not I would land postseason tickets. The Mets need to make like a shark and keep moving forward to return to contention in 2010. After the Mets won 73 games in 1968, their biggest offseason move was acquiring Wayne Garrett in the Rule 5 draft. Then again, 1969 was a miracle. It's going to take a lot more than Henry Blanco to turn the 70-win 2009 Mets into contenders next year. But it is too early to call this offseason a failure. If the Mets end up with Jason Bay, Bengie Molina, a half-decent, not-too-pricey starter and the return to health of all the injured stars, 2010 will look a lot better than it does now. That is, of course, a lot of ifs. I really wanted John Lackey on the Mets, but I can understand balking at a five-year deal for a pitcher who is over 30 and has been injured at the start of the last two seasons. ESPN's Buster Olney has a chart of the 16 starters since 1990 who signed free agent contracts of at least five years. The list has a lot more busts (Mike Hampton, Barry Zito, Chan Ho Park, Kei Igawa, Darren Dreifort, Denny Neagle) than big successes (Greg Maddux, Mike Mussina and maybe Kevin Brown). Olney adds that it is too early to judge CC Sabathia, A.J. Burnett and Daisuke Matsuzaka's contracts. The list does not include non-free agents who signed contract extensions, such as Johan Santana. Even after reading the list, I still wish Lackey were a Met, but if the Mets end up with Jason Bay instead, at least it will be easier to justify giving a position player a five year deal if it comes down to that. The most difficult thing to justify would be giving Molina, who turns 36 next season, a third year. I also have a bad feeling about giving Joel Pineiro a big contract, just as I'm glad it was not the Mets who gave Randy Wolf almost $30M for three years. But I don't think the Phillies' getting Roy Halladay drastically improves them, not when they had to give up Cliff Lee. Of course, the Phillies were already a good deal better than the Mets. But with the Dodgers in disarray because of the ownership issue and the Cardinals possibly losing Matt Holliday, it is not clear how many other NL teams are a good deal better than the Mets. There is still reason to be hopeful for 2010. Are the Boston Red Sox building a bridge to nowhere? Gather round, Boston fans. I have some questions about what you think about the state of your team these days. I wrote something for The Faster Times about Jason Bay's rejection of the Sox's offer, and the pending Mike Lowell trade. It seems to me that the concept of loyalty is very one-sided in Soxland. Lowell took the hometown discount to stay in Boston, and he gets traded (pending that thumb issue, of course). Same thing happened with Bronson Arroyo - he got traded two months after leaving four million on the table. Nice! The way the Sox front office trashes its players is so unseemly, yet it happens pretty much every single time a Boston player goes elsewhere. Tacky. Anyhow, Theo Epstein had some talk the other day about how 2010 will be the bridge period. Sounds like it's the cheap period to me, with another year of John Smoltz/Brad Penny type supposed "low risk/high reward" signings. Like this year, with the Sox signing the immortal Boof Bonser, after all! Of course, ticket prices are still going up during this transition time. Shocker! I’m not buying. The Sox have the dough to sign Matt Holliday or Jason Bay. Just like they had the money to bag Mark Teixeira last winter. But they keep getting beaten by the Yankees and then they cry about it. Stop. It’s hideous of the Sox and their fans to complain about the Yankees buying championships. Sure, the Yanks can afford Teixeira, CC Sabathia, and A.J. Burnett, just like the Sox were able to afford Matsuzaka and Drew. The Sox got Curt Schilling and Victor Martinez the same way the Yankees got Curtis Granderson this week. The Sox are not the Pirates. They are not the Brewers or the A’s. The Sox are Haves, not Have-Nots. Like the Yankees, the Sox are happy to raid the rosters of teams that can’t afford high-priced talent. Absolutely. I thought about that Schilling deal the other day, and how Sox fans I knew then tried to claim that Boston gave up a lot in that trade in Casey Fossum and Brandon Lyon. Please. It’s nice that Theo has a passion for player development, but asking fans to take a year off is outrageous. Henry is a billionaire and the Sox are making bundles of money. If you don’t believe that, call their partners at Ace Ticket and try to score a few tickets. Agreed. John Henry is worth a lot more money than George Steinbrenner is. Why are they holding the purse strings tight with one hand, and raising ticket prices with the other? One other thing I also read at the Boston Globe this week was about how Theo opposed the Josh Beckett/Mike Lowell for Hanley Ramirez trade, made in his brief absence from the team in 2005. That makes no sense to me. Yes, the Sox gave up a future superstar in Ramirez. But they also won the 2007 World Series thanks to Beckett and Lowell. That seems like a pretty fair tradeoff. Let's take a quick look at some of the 2010 Red Sox payroll obligations. Right now, they've committed to pay Texas nine million to take Mike Lowell off their hands, assuming the trade goes through. They're also paying nine million for Julio Lugo not to play for them. They'll be paying $14 million for J.D. Drew - a heck of a bigger injury risk than Jason Bay - to play right field; that is, when he isn't taking his weekly day off. They're paying $12.5 million to David Ortiz - which looked like a great deal at the time - to be their DH. Dice-K (or is that Dice-BB, as my friend William calls him?) may actually show up to spring training in shape this time around to earn his $8 million this year. And don't forget that captain Jason Varitek will be getting $5 million as a lifetime achievement award for 2010. Yes, yes, I know the Yankees have ridiculous contracts as well. (Kei Igawa, anyone?) My point is that Theo Epstein, for all his brilliance, has made a bunch of bad deals that have cost his team. And that not many other teams could afford to essentially pay other teams to take on their players, the way Theo did with Manny Ramirez, Julio Lugo, and is trying to do with Mike Lowell. So sorry, I'm not going to feel too bad for the Red Sox's payroll obligations. If they're having to pinch pennies now, it's because of bad decisions by Epstein, not because of the Yankees' dominance. Of course, now that I've written this article, watch the Sox sign John Lackey, Matt Holliday, Adrian Beltre, and some other high-priced free agents this afternoon, just to prove this all irrelevant! But what do our Sox fan readers think? Tell us about it! What is Curtis Granderson's home run call going to be? 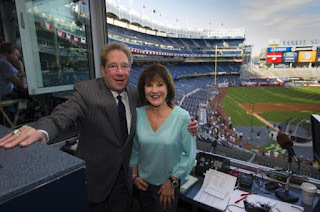 Now that the Yanks have a new center fielder in Curtis Granderson, all we have to do is figure out what home run call John Sterling will use for him. First off, you know some play on words regarding a "Grand" slam is inevitable with Sterling. And some out-there call we haven't expected will also come up. I was listening to Curtis Mayfield's great 70s song "Pusherman" at the gym the other day, and it occurred to me that Sterling will have some line using Mayfield's name with some great defensive play. So, what other calls will Sterling make? Any thoughts? Incidentally, check out my Faster Times article from last week on the trade. And the more I read about Granderson, the more I like him. I also hope he continues his blogging for Yahoo Sports Big League Stew site. In other news, I wrote on the 29th anniversary of John Lennon's death at my personal blog, Swan Squawking. Check it out here. What do you think John Sterling's home run call for Curtis Granderson will be? Tell us about it! Early in 2009, a 32-year-old pitcher new to New York with initials for his first name introduced pies in the face to an often-tense clubhouse. His new team, which had finished a disappointing 89-73 in 2008, missing the playoffs, would do far differently in 2009. They would win 70 games. Early in spring training, new Met J.J. Putz hit SNY' s Kevin Burkhardt in the face with a pie. Putz and Cerrone had the right idea. But Burnett was the one who took this concept all the way to November, while Putz did not make it past the first week of June. The three-way trade for Putz was one of the highlights of last year's offseason for Mets fans. Little did we know at the time that Omar Minaya was trading for damaged goods. With Putz signing with the White Sox and Jeremy Reed probably not coming back, all Minaya has to show for the trade now is Sean Green. It is too bad that the Mets never got a chance to see what a healthy Putz could do. But it is probably just as well that Putz' pie-throwing was curtailed. Because the way things went last season, one of those pies in the face probably would have resulted in some sort of injury and would have been played endlessly on YouTube. So, Kate Hudson went on Late Show With David Letterman this week to promote her nenw movie, "Nine." Shockingly (not really), Letterman kept on badgering her about her boyfriend, Alex Rodriguez. Anyhow, here is the clip. The Miracle Has Landed: The Amazin' Story of How the 1969 Mets Shocked the World is a new book celebrating the Miracle Mets. The book is a project of SABR (Society for American Baseball Research) that contains biographies of every player, coach, broadcaster and signficant front office member of the 1969 Mets. It also features essays on the greatest moments of the season, including perspectives from fans of the Cubs and Orioles, as well as rare photos and images of 1969 baseball cards. I have not read the entire book yet (it is almost 400 oversized pages), but I have read more than enough of the essays and sidebars to recommend it highly to any Met fan. If you are familiar with 1969, the book will bring back many great memories, but you are likely to learn many new facts as well. If you are not familiar with 1969, this book is a great place to start. "Miracle" co-editor Matthew Silverman has written numerous books about the Mets, including "Shea Good Bye" (co-written with Keith Hernandez) and "100 Things Met Fans Should Know Before They Die." While reading the book, I learned that Jerry Koosman avoided getting released in 1966 because he owed Met farm director Joe McDonald $50. What did you learn from doing this book that you did not know before? --That Gil Hodges used almost 100 different batting orders during the season. If you look at the postseason batting orders, Hodges, who advocated using all his players, had one lineup against a right-hander and a second order against a lefty. During the season, though, he changed the order on a nearly nightly basis--even sitting slugger Donn Clendenon a lot of the time. It worked. --That the Mets schedule originally had them playing without a day off for most of the first month, but it rained a lot that spring--and for much of '69--so the Mets benefited from a lot of rainouts while the Cubs got off a scalding start. Those games were made up in August, when the Mets were hot and their pitching unstoppable. The Mets swept six of the nine doubleheaders they played in the final weeks of the season while the Cubs floundered. Most Met fans are familiar with such legendary 1969 games and moments as Tom Seaver's "imperfect game" and the black cat that walked in front of the Cubs' dugout. What lesser-known game or event from 1969 would you point to as further evidence of what a special year it was? There are probably a dozen games from that season Mets fans still remember, like the 1-0 wins where the pitchers drove in both runs in the doubleheader in Pittsburgh; Cardinal Steve Carlton 19-strikeout game he lost on two Ron Swoboda home runs; and even the Mets getting no-hit by Bob Moose at Shea two weeks before the season ended, but there was a remarkable win at the end of August at a time when the Mets could have faded. The Mets had won 12 of 13 to go from 10 back to 2 1/2 behind, but Juan Marichal skunked them in San Francisco while the Cubs won in Atlanta to go back up by four. The next afternoon, August 30, the Cubs had already won when the Mets allowed a game-tying double to Willie McCovey (NL MVP in '69). It looks like the Giants will win in the ninth when McCovey hits another double, this time the other way against the "McCovey shift," but left fielder Rod Gaspar makes a desperation thrown to the plate and gets Bob Burda. The catcher, Jerry Grote, thinks it's the third out and rolls the ball onto the field. First baseman Donn Clendenon races over, grabs it, and throws to third to get McCovey. So Willie Mac doubles into a double play! Clendenon homers the next inning. The Mets finish 26-9 while the Cubs won just 10 of their last 28. What 1969 Met player does not get the recognition he deserves? A few of the guys have faded a bit from the public's appreciation, like Cleon Jones, who hit .340 in '69, but most Mets fans still know and love him. An important player who is often forgotten is reliever Ron Taylor. The starters on the Mets were superb and had more than 50 complete games, but when they couldn't go the distance, they called on Taylor. He was also the only Met with postseason experience (as a 1964 Cardinal) and he got the last out in the first World Series win in Mets history in Game Two. He helped Tug McGraw adapt to a new role in the bullpen and between them they were magnificent down the stretch. Taylor is among the last of the '69 Mets still affiliated with a major league team. The only non-American on the '69 club, the Toronto native became a doctor after he retired and has been team physician for the Blue Jays for 30 years. If Tampa Bay had won the World Series in 2008 after never coming close to a winning season in the franchise's first ten years, do you think that would that have been as big a miracle as the 1969 Mets? There was no ESPN, Internet, Twitter, or other methods of instant hype in 1969 and to tell you the truth the fact that there wasn't probably makes the '69 Mets more of a legend. The Rays were more of a fact while the '69 Mets seemed like the stuff of fiction. The '08 Rays were a remarkable story, but they were created during a time when there were many ways for an expansion club to help itself, such as free agency, while the Mets had to rely almost solely on players other teams didn't want. The Rays screwed up repeatedly and were terribly run. No one thought their losing lovable, as Mets fans had of their club in the early years. And I don't mean to sound provincial, but if you have a New York Miracle or one in Tampa, I think the New York one probably wins out in people's perceptions. New Hall of Famer Whitey Herzog was an important part of the Mets' organization in 1969. How do you think Met history would have been different had Herzog become Met GM or manager in the early 1970s? I like to think there'd be more than one world championship banner since '69 if Whitey had been kept around. We have a piece in The Miracle Has Landed on Herzog following the M. Donald Grant bio. Those two couldn't stand each other. As Mets farm director, Herzog belittled Grant, the board chairman, because Whitey wanted him to stop meddling. He wasn't subtle about it. So when GM Johnny Murphy died a couple of months after the world championship, the replacement was blundering Bob Scheffing (the guy who traded Nolan Ryan against Herzog's advice) because Grant wasn't about to let Herzog get it. When Gil Hodges died in '72, Herzog wasn't even considered as replacement. Herzog left and started a managing career that was good enough for the Hall of Fame. Herzog is one of the great "ifs" in Mets history. He made the Royals into a three-time division champ in the late 1970s and then he took the Cardinals to three World Series (two at the Mets' expense). He still might be the only guy I can think of who could make the 2010 Mets legitimate contenders because Whitey knew how to build a team around a big ballpark in St. Louis. It's not easy, but Herzog made it look that way. Next season, the Mets will display their history more prominently at Citi Field. 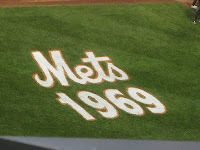 Aside from what has already been announced, how would you like to see 1969 commemorated at Citi Field? I was disappointed the Mets wore a mock-up of an old New York Giants baseball uniform--against San Francisco!--but no one thought that maybe during the 40th anniversary season they should wear the '69 uniforms, with the Major League Baseball logo patch (1969 was the first year for that). I'd still like to see them do that and I think a lot of Mets fans wouldn't mind seeing that as the alternate uniform instead of the one the team recently announced to groans throughout the tri-state area. I really liked the 80-foot tall '69 tribute they had at Shea above the Mets bullpen. I could certainly live with a tribute where everyone could see it, such as in the food court area or maybe on the roof of the Robinson Rotunda, along with some words that explained who they were and why that was the touchstone moment for this franchise. No matter how many years ago it was, 1969 was the year the Mets had their confirmation, bar-mitzvah, what have you. No expansion team had ever won a championship before the '69 Mets and none would again until 1985. The '69 Mets are always worth remembering and celebrating. So I met Yankee manager Joe Girardi today, and I was so excited, I lost my cool - big time! Girardi was in town doing a fundraiser at Chipotle in Times Square. For a $5 donation to his Catch 25 foundation, you got a burrito, chips and salsa and a drink, and the chance to meet Girardi. What a deal! And not only did I get to meet Joe and say hello, I got to shake his hand, get an autograph, and get my photo taken with him. Awesome! As many Squawker readers know, I wasn't exactly a fan of the later years of Joe Torre's managing - or, more to the point, his snoozing in the dugout while collecting a paycheck from 2004 on. Remember from history class how Cato the Elder ended every speech by saying, "Carthage must be destroyed"? Well, I was kind of that way about Torre in 2006 and 2007 - the first two years of Subway Squawkers - with me repeatedly saying "Joe must go" in the blog. I also wrote repeatedly that the Yanks would never win another ring with Torre at the helm. I was in Florida when Baltimore’s pursuit of Joe Girardi went down last week. You know what I wish happened? That Cashman whispered in Girardi’s ear to not take that job, because the Yanks would be needing him as manager very soon. I’ve said it before, and I’ll say it again, that my vote is for Joe Girardi. Girardi has shown that he is a good motivator. He knows the Yankee way, but he’s also learned different ideas. And he knows what ails this team. That was clear from listening to him announce games this year. True, Girardi is an argumentative guy, who doesn’t suffer fools gladly, but frankly, that’s what this team needs after Torre and his green tea and his classiness. I’m tired of this team losing with class. I’d rather the Yankees be feared than be loved, and it’s been a long time since the Yanks have been feared. Girardi would be just the guy to bring that era back. And when Torre and the Yankees finally parted ways in October 2007, I championed Girardi some more. I also predicted that the Yankees would pick Girardi, at a time where pretty much every single mainstream Yankee writer in town was sure that Don Mattingly would be the successor. I wrote "the Yankees will pick Girardi over Mattingly for two reasons" - because "Girardi is the opposite personality of his predecessor, while Mattingly is very similar, personality-wise, to what the Yankees have had," noting that "most replacement managers fill the void of what their predecessors lacked." I also pointed out that the Yanks would be "stuck with Donnie Baseball as manager forever, even if he stinks, for fear of offending the fanbase." And guess what, I was right! My oh-so-restrained headline on the day of the new managerial announcement was "Joe Girardi gets offer; Squawker does Snoopy Dance"! Fast forward two years. Although I don't always agree with Girardi's managerial decisions, he is still a great hire. I also think he hasn't gotten the credit he deserves for this team's championship. All too many writers seemed gleeful to rip him for perceived errors, like the three-man playoff rotation, without giving him the credit he deserves for No. 27. And for all the tired talk about how Girardi was so inflexible, he actually did something amazing - allowing an entirely new Yankee culture to flourish, while keeping the Core Four in the fold. Not only did these Yankees win it all, but they were the most likeable team in ages. Anyhow, when I met Girardi today, I tried to explain to him how happy I was for him, and how much I admired him, and about how I wrote about him in the blog, but I sounded more like a babbling brook than anything! That's what happens to me when I get overexcited. Before leaving Chipotle, I did pull myself together enough to say to Girardi, "thank you for No. 27, here's to No. 28!" and wave. At least I did say one semi-coherent sentence! What do you think? Tell us about it! As we get ready to pay attention to baseball's winter meetings, I spent most of this weekend paying attention to another sport - football. Specifically, my beloved Texas Longhorns. How about them Horns? They're going to the BCS National Championship Game, baby! I was fixin' to have a coronary Saturday night when watching the Texas Longhorns/Nebraska Cornhuskers game. My brother (a fellow Texas alum - he graduated from UT's Law School) and I were on the phone watching the game when Colt McCoy seemed to forget that there was a time clock headed toward zero. I didn't exactly handle it well - I was screaming "Stop, stop, stop!" on the phone - and at my TV screen! If the Longhorns had lost their national championship hopes then and there, thanks to literally running out of time, it wouldn't have been pretty for Texas - or for McCoy.Or for me, for that matter. I figured all the haters would come out of the woodwork and give me a hard time. And Squawker Jon would talk about Nebraska in the same awe-struck tones with which he describes the 2004 Red Sox. Good grief. Fortunately, the Horns were able to win, thanks to getting that one second back after the referees conferred. And Hunter Lawrence kicked a very tough field goal to win the game - and a chance at the national title. But some in the media think the Longhorns don't belong there. ESPN's Gene Wojciechowski is not happy over the BCS voters picking Texas, writing two columns whining about the subject. He thinks that TCU was more deserving. Wojciechowski also predicts that Alabama will win the national championship, although he does it in a weaselly way, writing: "My pick? Not positive, but I'm leaning hard toward the Land of Houndstooth." Dude, you just spent a gazillion words saying that "the Longhorns are leaving oil marks on the driveway late in the season," and you're "not positive" whether Alabama can beat them? Good grief. If the [three-man rotation] decision works, Girardi will get a borough named after him. If it doesn't, he'll get ripped. I'll beat the rush and say that if he goes through with it, Girardi will be pushing one managerial button too many. After Game 5, when A.J.Burnett spit the bit, the writer continued berating Girardi for picking Pettitte for Game 6, writing "Just so you know, Pettitte is 5-7 with a 4.18 ERA in 18 career short-rest starts.If we have these stats, so does Girardi. Yet he's willing to risk the World Series on it." Yet after the Yankees won the World Series, with Andy Pettitte as the winning pitcher, he didn't have a word to say about Girardi's accomplishment, or about him being right about the three-man rotation. Typical. Winning ugly is still winning. Texas is 13-0. If you’re thinking Texas had no business winning, you’re dead wrong. Texas found a way to win, and in the end, that’s all that matters. I did a piece for BaseballReflections.com in advance of next week's Winter Meetings on what the Mets need to address during the offseason. You can check out the piece here. The Mets have two big needs - power-hitting left fielder and no. 2 starter - and many people put those needs in that order. But I rank no. 2 starter first. The Met lineup is in better shape than their starting rotation. In 2010, the Mets project to have a healthy Jose Reyes, a full season of Carlos Beltran and a full season of Jeff Francoeur. The Mets appear committed to getting more offense from their catchers as well. Even if David Wright does not regain his power stroke, the Mets should have a more productive lineup than in 2009. That is not to say the Mets should stand pat with their lineup - Angel Pagan and Luis Castillo may well have overachieved in 2009 and Daniel Murphy could continue to underachieve. If the Mets end up in a position to sign Matt Holliday, that would be great. Especially if they are not in a position to sign John Lackey. Because while they could really use both players, they need Lackey more. The rotation after Johan Santana last year was a shambles. Mike Pelfrey regressed, John Maine was hurt again and Oliver Perez, well, what can you say. If all three of these hurlers pitch up to their potential next season, the Mets will have a strong rotation. But that is a huge "if." I would be happy if two of them were reliable. Even if all four did manage to do well, that still leaves the fifth rotation spot and depth for inevitable injuries. So the Mets really need two additional starters. I suppose a case could be made for signing, say, Joel Pineiro and Jason Marquis as opposed to John Lackey, if it comes down to that. But I am leery of the mid-rotation starters who only have value because of position scarcity. Pineiro may well be a creation of Cardinals' pitching coach Dave Duncan. Marquis lost his spot in the Rockies' rotation by the end of the season. If the Mets end up with any two of Pineiro, Marquis, Randy Wolf, Jon Garland, Rich Harden and Ben Sheets, odds are that at least one of the signings will not work out. Especially if it is Harden or Sheets. So the Mets could end up spending as much or more than they would spend on Lackey and end up with one lesser pitcher. But neither Lackey nor Holliday is the sort of can't-miss superstar that is worth landing at any cost. Holliday is no Mark Teixeira, whatever Scott Boras says. So if the Mets end up with neither, it will not necessarily be a bad thing. But it won't be good, either. Omar Minaya has a lot of work ahead of him. Starting next week, we will get a better idea as to whether he can do more than sign aging backup catchers. What is the Mets' biggest need this offseason? Tell us what you think. The horror, the horror: Why "Jersey Shore" is trashtastic! This has absolutely nothing to do with the Yankees, but I've written about "Jersey Shore," MTV's new reality series on self-described Guidos and Guidettes gone wild. And as a native New Jerseyite, I felt compelled to weigh in on the program. So I've written my thoughts on the new program at my personal blog, Swan Squawking. Check it out. It's hot stove season time in the baseball world, and I'm going to be squawking about what's going on in Yankeeland tonight. I'll be in Pro Baseball Central's Blog Talk Radio show with hosts Stephen Keane of the Eddie Kranepool Society blog, and Joe McDonald. I should be on at 9:30 p.m. tonight. Go here to listen live. In other news, Uncle Mike has shot down our request that he show up at Professor Thom's with us for Tuesday Night Trivia. "A Tuesday night at a Red Sox bar? I'd have to get my radiation suit back from the cleaners," he declared. Bummer. We are the champions - at trivia! blog. We didn't win that time. But last night, we returned to Tuesday Night Trivia and proved to be, well, omnipotent at trivia - thanks to a little - make that a lot - help from our friends! Here's the story - we invited Yankee fan Squawker readers Jennie and Barbra and our Met fan friend Dina to meet us at Professor Thom's for trivia night. These three additions to our team proved to be as critical to our success as CC Sabathia, Mark Teixeira, and A.J. Burnett were to the 2009 Yankees. The questions we faced were very tough. And Jennie, Barbra, and Dina proved to be the difference-maker between the first time Jon and I competed, and this time. Jennie knew the correct answer to what was the first animal in space - it was a dog, not a chimpanzee, as Jon and I had thought. Barbra knew that Five for Fighting released the song "100 Years." And Dina helped us get a perfect score in the movie quotes section. There was one mishap, thanks to Squawker Jon - he got ketchup all over our papers, and we had to get new blank entry forms from the Omnipotent Q. Anyhow, after five rounds of trivia, the game ended with a tie between our team and the Onstar Tiger team. So we had to do a one-round playoff between our two teams, kind of like the 1978 Yankees-Red Sox playoff game. And the question was - how many years is it between the 2012 London Olympics, and the previous time London hosted the games. Squawker Jon was the Bucky Dent here - he knew that London had previously hosted the 1948 Olympics, so it was 64 years (I checked his math.) The other team guessed 88 years, so our team won it all! Whoo-hoo! I wanted to do a victory lap around the room and yell "Count the rings, baby!" to taunt Red Sox Nation. But instead, I just joked to our host about doing that. In addition to the thrill of victory - I'm still smiling right now thinking of our triumph! - we each won a gift certificate to Professor Thom's. I haven't worn Yankee gear to the bar so far, but when I go back to redeem my winnings, I will be sure to wear some Yankee World Championship clothing! And now there's this trivia triumph that I got to be a part of. As you may have guessed, I'm very competitive, and the fact that a mostly Yankee fan team won in a Red Sox bar is even sweeter! I'm thinking we should get another Squawker contingent to attend another Tuesday - imagine Uncle Mike in such a contest! Let me know at subwaysquawkers@gmail.com if you would like to join us in the future. Thanks to our friend The Omnipotent Q for hosting the event and to Professor Thom's for our winnings! Joe Girardi helps out Jets - how about the Mets? Joe Girardi showed up at Jets' practice Tuesday to instruct quarterback Mark Sanchez in the fine art of sliding. When spring training starts, perhaps Girardi can offer the same courtesy to the Mets. After last season, the Amazins could use some tips not just in sliding, but in all facets of baserunning. Meanwhile, the Mets' offseason continues to limp along with word that the team has signed a player who said upon signing, "I will always consider myself a Phillie." And regarding the Mets: "It’s the last team I ever saw myself playing for." Chris Coste will be 38 in February. He is on his third team since the Phillies released him in July. One would think that this fringe player, who did not make it to the majors until he was 33, would be grateful that anyone wanted him. Lucky for him that Omar Minaya is up to his usual tricks of mostly pursuing older players (Elmer Dessens, 39 in January, Alex Cora - 34). Coste's signing has had the unlikely effect of making me miss both Tom Glavine, whose heart was in Atlanta, but did have a Hall of Fame career there, and Brian Schneider, who just signed with the Phillies. Let's hope that spring training does not feature Coste waving his 2008 World Series ring around, criticizing Jose Reyes and Francisco Rodriguez for excessive celebrations and telling Mr. Met that he's no Phillie Phanatic. I've written two pieces for The Faster Times that should be of interest to Squawker readers. * First is about Derek Jeter winning Sports Illustrated's Sportsman of the Year. My point is that while it's well-deserved, SI went too far in suggesting that Jeter is on the same level as Babe Ruth and Lou Gehrig. Isn't it enough that the captain is a first-ballot Hall of Famer and the most beloved Yankee since Mickey Mantle? Why make such over-the-top comparisons with two of the greatest players of all time? * Second is about TBS firing Chip Caray. I would like to see TBS dispense with the national broadcasters for the playoffs. Why not have, say, Michael Kay and Jerry Remy together in the booth if it were a Yankees-Red Sox ALCS? Would save the network money, and please fans, too.